We strongly believe Ploppi’s Bakery fits perfectly with this year Engaging category, not only because it embodies the concepts of “Capturing attention”, “creating delight” and “delivering meaning“, but also because is more than a toy, is a complete engaging experience. As an interactive hungry plushy monster, Ploppi is the child favorite companion. One that he can play with all day, but also, one that will help him complete his speech exercises, once the time is right. It allows parents and child to bond through speech development and play, engaging the family as a unit and supporting the child with speech disorders. Traditionally the child has to be pushed by either their parents or their speech therapist to perform these exercises, but it always feels more like homework than actual play. This creates a disconnection between the child and the exercises, resulting in poor speech development, and later on even slow learning and poor social development. But, why speech exercises cannot be fun? With Ploppi’s Bakery we believe breach that gap and made speech development a better experience for the child. 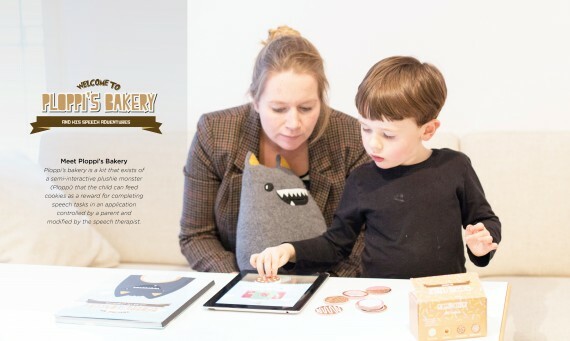 The kit consists of the plushy monster Ploppi, a book explaining his story, a set of interactive cookies to feed him and a tablet app that controls the speech exercises. This experience is not only designed for the children, but also for the parents who, following the speech therapists’ advices, are always in control, and by their actions, like activating the app, they can trigger Plopi’s growling sounds. These will draw the kid’s attention and, by auditory and haptic feedback, indicates that is time to bake the cookies. As the only way to do that is by completing the speech exercises, the child, wanting to help his companion and friend, will drag the parents and complete the speech exercises, changing the actual dynamic of speech exercises at home reversing the dragging role. The speech exercises are also engaging themselves. Using fun animations and sounds, they capture the child attention while engaging him to complete the speech exercises. They are also customized for every child by their speech therapist using the tablet application. Ploppi’s Bakery is definitely not an interactive toy. Is a complete environmental playful experience that uses storytelling and play, along therapists’ speech exercises to capture the child’s attention, engage him with the exercises while creating delight, and deliver meaning in the form of speech therapy that opens up for parents to empower their child and give appropriate attention and support in their social development.